Due to the high traffic that this page receives, I will actually write what I know about groundhog trapping. I started in Pennsylvania, when I worked as an apprentice to a fur trapper. As a fur trapper, he usually used lethal traps for groundhogs, specifically, connibear body grip traps, size 120 double-spring. He'd set these traps right over the groundhog burrow, and they'd kill the animal on contact. They worked very well. However, these traps are pretty much impossible for a non-trapper to use. They are very dangerous. I never used lethal traps in my own business in Florida. I used only live cage traps. If you want a surefire way to catch and kill groundhogs, hire a pro that uses such traps. 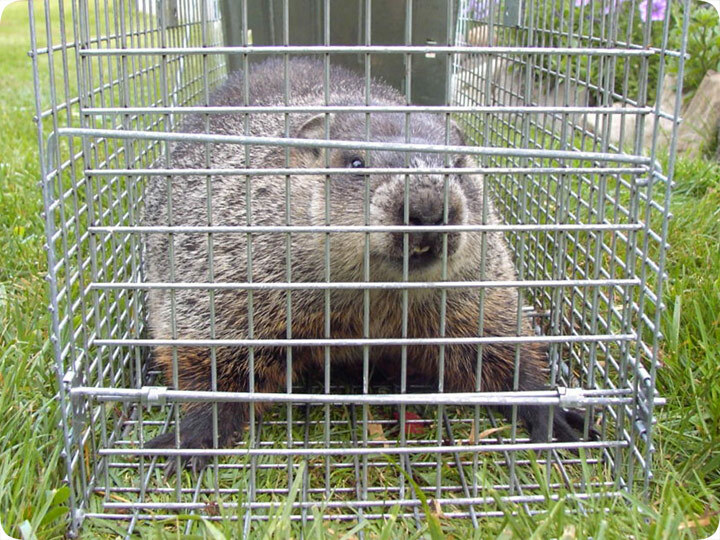 You can catch groundhogs in cage traps. Use a large trap, such as a Havahart raccoon trap. Set the trap near the burrow entry holes, or the runways (groundhog paths) near the holes. Bait the trap with fresh vegetables, such as broccoli or corn. You can even set the traps right on top of the borrow holes, and line with leaves and debris and such, and a groundhog, if it's already outside from a different hole, will just walk right in. You can also use barriers, such as planks of wood, placed in a V-shape leading to the door of the trap, to help "funnel" a groundhog into the trap. Cage trapping can take a little patience. A professional trapper with experience in trapping groundhogs will usually do a much better job than an amateur, that's just how it goes. 08.20.2006 - Groundhog trapping, in Florida of all places? No, I have to admit that I did not trap this groundhog at all. It was captured by my good friend Bruce, who lives on Massachusetts. The critter was digging under his porch and eating his plants, and he finally decided that it had to go. He called me to ask for my expert advice. I carefully described a trap consisting of an apple under cardboard box propped up by a stick to which a string is tied. Bruce is so trusting, that he set up said configuration, and waited many frustrating hours patiently waiting for the groundhog to go for the apple, so that he could yank the string and catch it. While I'd have loved for him to momentarily succeed, followed by the woodchuck simply upending the box and escaping, no such luck happened. The groundhog did not go for this trap. When he informed me of, and apologized for, his failure, I gave him new advice, consisting of sticking dynamite disguised as a carrot down the hole. He then caught on that I was toying with him, cursed my name, and hung up. He researched the problem online, and found, from a more respectable wildlife trapping website, that he needed a large metal cage trap, such as a 10x12x32 Havahart model 1079 trap, and that he should set it flush on the ground near the animal's burrow pathways, and that he could bait it with any number of fresh vegetables, such as broccoli. He did this, and soon he had success! He trapped the above groundhog and sent me the above photo, which I now proudly display for you. So if you need real expert advice on groundhog trapping, just email Bruce at [email deleted at Bruce's request - turns out he didn't appreciate all the awesome emails he got from you fine folk with groundhog problems] and he'll tell you all the tricks of the trade. If you write to me, I'll just tell you tricks. Do it yourself: Visit my How To Get Rid of Groundhogs page for tips and advice.